You can solve two problems by making free craft projects using Mylar coffee bags. First, you will gain a new creative outlet, and second, you'll be recycling non-biodegradable products at the same time. Mylar is the brand name for a durable but thin plastic sheet product made by DuPont. You can paint it with spray paints that are labeled for use on plastic. Use spray adhesive to glue it to other surfaces or Super Glue for smaller items. Duct tape adheres well to Mylar for projects that will still look good when visibly taped, and you can find duct tape at your local hardware store in several interesting colors to spice up your crafts. Freecycle - Join your local group and post a request for Mylar bags. Craigslist - The for sale section of your local Craigslist site has freebie listings and also a place for you to request items. People will be more than happy to help you recycle. Coffee delivery services - Call local businesses that stock office buildings with coffee, or ask friends who work in large buildings to help out. Because Mylar is not porous, you will need to buy spray adhesive from the craft or hardware store. Some projects require duct tape instead of glue, so have plenty of tape on hand before beginning your craft. If you want a smooth and shiny surface, you may need to press air bubbles out of your Mylar with a credit card or the flat edge of a knife. Spray paints designed especially for plastics, such as those made by Rustoleum, will adhere to Mylar. You can buy them at hardware or discount stores if you don't have any half-empty cans at home. Some Mylar coffee bag projects are not only free, they are easy enough for kids older than three. Children under three years old should not handle Mylar bags, since the bags could be a choking hazard. Seedling containers - Fill two thirds of the bag with potting soil and plant your seeds. When the seedlings outgrow the bags, you can cut the bags open for re-potting, wash the bags, and use them for another craft. Doll jewelry and clothing - Glue strips from bags to cover empty cardboard paper towel tubes for instant doll bracelets, or gather a bag onto the bottom half of a strip of silver duct tape to make a shiny party skirt for Barbie. Fasten discretely with a small beaded safety pin. Halloween costumes - Glue layers of Mylar coffee bags over worn-out t-shirts and sweat pants to create aliens and over cardboard forms to make realistic-looking robots. 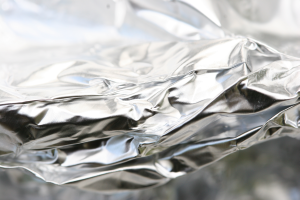 Mylar is much more durable than aluminum foil. Cover toy guns with glued-on Mylar sheets and paint in the details with plastic paint. Book covers - Glue or tape several bags to a paper book cover for an instant trend setter. It will outlast a plain paper cover. Mosaic offers instructions for making a coffee bag tote. You can substitute your own Mylar bags for those mentioned in the supply list. One project that is not so much of a decorative craft as a way to recycle your Mylar bags sensibly, is to tape several Mylar bags together to form a Mylar blanket or sleeping bag. You could also use the taped sheet underneath a sleeping bag when camping to protect yourself from the cold ground. Keep one in your car during the winter, and hand a few out to homeless people who sleep on the streets during winter. You could save a life. Wrap small gifts with Mylar bags, and cut strips to form little bows to decorate your packages. You can even paint designs on the wrap for added charm. If you are really ambitious, try embellishing a duct tape prom dress with Mylar bags by taping the gathered edges of the Mylar to the shoulders and at the waist for cute ruffles. Your daughter will be the belle of her prom season. These are just a few free craft projects using Mylar coffee bags. Once you try your favorite ideas, Mylar's durability and reflective properties are sure to spark a few ideas of your own.